05-23-2012 CHASE LOG: NEBRASKA This was Day 2 of being a guide for Silver Lining Tours. We drove 1,000 miles the day before, from Oklahoma City, OK to near Bowdle, SD to chase a couple of marginally severe thunderstorms, ironically on the same date as the Bowdle wedge tornado in 2010. The set-up this day was pointing at an area around Grand Island, NE or into northwest IA along a cold front that was settling into the region. We left Aberdeen, SD south on Hwy 281 towards Grand Island. As we approached O’Neill, NE, there was some debate on whether the better potential would be across northwest IA or southeast NE. We decided to split the difference and head southeast on Hwy 275 towards Norfolk to buy us some more time. Upon doing so, the new RAP guidance came in and was pointing at the area around Columbus as the place to be, so we headed south on Hwy 81 as storms began to develop on the boundary. These were moving quickly to the east with the front so we progressed east on Hwy 30 toward Fremont. Upon reaching a storm near North Bend, NE, it produced a gustnado right in town and we were able to drive right along-side of it. The closest that I have ever come to a gustnado! We moved northeast with the storm from Fremont to north of Blair as the storm began to show some signs of rotation. The Missouri River became a problem and we were forced to backtrack and cross the river near Blair. 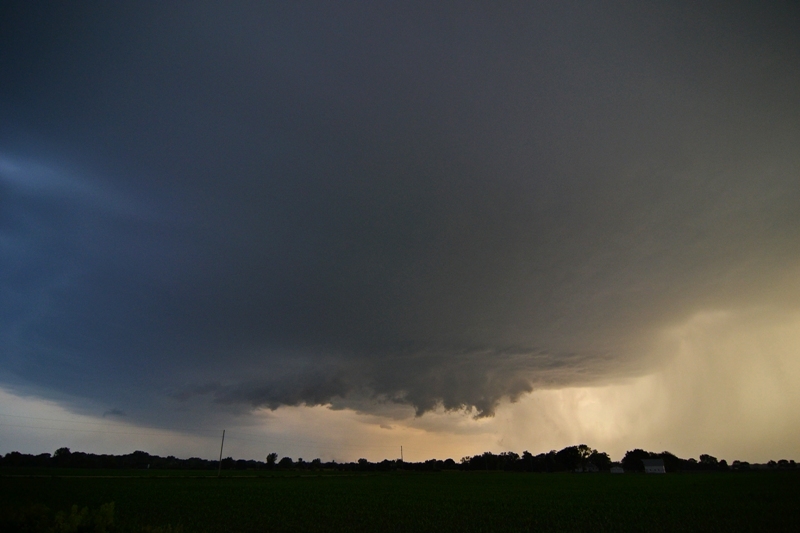 The storm continued to show signs of rotation and was severe warned through the duration, but we determined it was uncatchable into western IA due to our delay crossing the river over to Missouri Valley, IA. Another storm started to take shape to our southwest near Seward, NE so we crossed back over and eventually intercepted the storm near Valley, NE. It was tornado warned for a short duration due to rotation indicated on radar, but did not produce a tornado. What this storm did have was very good structure as the supercell had a large bowl base and actually had a short-lived wall cloud southwest of Valley. After the wall cloud occluded, it formed a terrific tail cloud into the base towards the time it was about to move over us with great horizontal, rolling motion. We got out of there to get a glimpse of what kind of hail this storm was dropping to the north. Near the intersection of Hwy 275 and Hwy 36, we encountered numerous quarter to half dollar size hailstones near the NWS office. Thereafter, we decided to head towards the hotel in Lincoln, but another storm came up at us from the southwest and we went up I-80 to watch a magnificent lightning display before heading back. Whoa! A double rainbow! Heading east on Hwy 30 near Columbus, NE. Storm approaching us from the southwest with lowering under base near Valley, NE. Wall cloud starting to form on the mothership shaped supercell southwest of Valley, NE. Wall cloud becoming tighter with faster upward motion and condensation. Hail core to the right. The closest that this storm came to producing a funnel. Ground dragging inflow tail cloud into the base as the storm started to lose the wall cloud and become outflow dominant.